Here are some facts about the Lancaster Bomber. The Lancaster Bomber was one of the most famous aircraft of World War II. It first saw service in 1941 and became the RAF’s main bomber during the war. 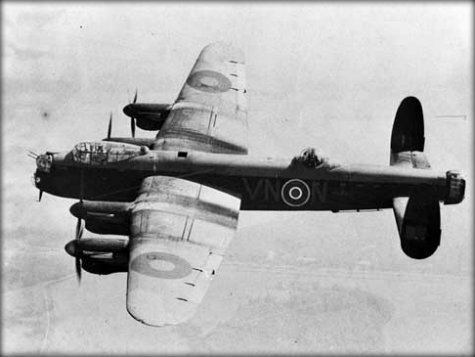 The first prototype Lancaster flew in January, 1941. A total of 7,377 Lancasters were made, after the first one rolled off the production line in October, 1941. It carried a crew of 7 and could fly at about 454 kmh. The plane was just over 21 metres long, had a wingspan of 31 metres and a flying range of 4,000 km. The Lancaster was normally armed with 8 Browning machine guns, as well as bombs. Some planes were modified so they could carry the so called Grand Slam bomb, weighing 10,000 kg. During World War II, Lancasters flew over 156,000 sorties, or raids. They dropped over 50 million incendiary bombs and over 608,000 tons of explosive bombs. One of the most famous bombing raids was a 1942 raid on Cologne, Germany. Over 1,000 bombers dropped bombs on the industrial city, destroying over 600 acres. Many Lancaster crew members were given medals for heroic actions while flying. Guy Gibson had flown 170 missions by the age of 24 and was awarded the Victoria Cross. Towards the end of World War II, Lancaster Bombers dropped food into the occupied Netherlands. After the war, the Canadian Air Force used them and they were even used to transport passengers to South America. The Lancaster features in several films about World War II. Most famous is the 1955 film The Dam Busters which documents the plan to destroy German dams with so called bouncing bombs. Today, 17 Lancasters survive. One is used regularly in air shows as part of the Battle of Britain Memorial Flight, and flew at the Queen‘s 80th birthday in 2006. What next? Learn more about the Battle of Britain and the Spitfire, another important plane used during WW2.